DAVOS, Switzerland, Jan. 22, 2019 /CNW/ - Corporate Knights released its 15th annual list of the world's 100 most sustainable corporations in Davos today, following a rigorous analysis of some 7,500 companies with US$1B+ in revenues. A comparative financial performance and corporate longevity analysis of the Global 100 companies against the MSCI All Country World Index supports the mounting case that sustainable corporate performance is consistent with equal or better returns for investors and greater corporate longevity. According to the Toronto-based sustainable business magazine and research company's latest data crunching, the world's most sustainable corporation in 2019 is Chr. Hansen, a Danish bioscience company, which uses "good bacteria" to provide natural means for preserving food, protecting plants and reducing overreliance on antibiotics in livestock farming. Eighty-one per cent of Chr. Hansen's revenues are categorized as "clean," according to the Corporate Knights taxonomy. It also has strong representation of women on its board and in its executive ranks, and the company now links executive compensation to corporate diversity targets. Other top spots on the 2019 ranking: second-place went to Kering S.A., a French apparel and accessories manufacturer, which pioneered Environment, Profit & Loss accounting as a way of making environmental impacts directly visible on the corporate bottom line. Kering was ahead of all other companies on representation of women on its board at 64 per cent. Third place went to Neste Corporation, a Finnish petroleum refiner that earned 25 per cent of its revenues from refining biofuels and aims to boost that to 50 per cent by 2020. The Global 100's "clean revenue" metric, which was introduced in last year's ranking and now counts for 50 per cent of each company's score, measures the percentage of revenues earned from products or services that have environmental, or well-defined social benefits. Refined "peer group" definitions used to score companies were introduced this year and have improved the comparability and precision of the rankings. Analysis of the age composition and financial performance of the 2019 Global 100 continues to demonstrate that top sustainability performers tend to last longer and perform better for investors than comparator companies. The average age of a Global 100 company is 87 years, while the average age of a company in the MSCI All Country World Index (ACWI) is 63 years. Comparative investor returns were assessed using the "Global 100 Index," which is calculated by Solactive and available via Bloomberg and Thomson Reuters. Composed of Global 100-ranked companies, it is equally weighted and mirrors the sector composition of the MSCI ACWI on a percentage basis. 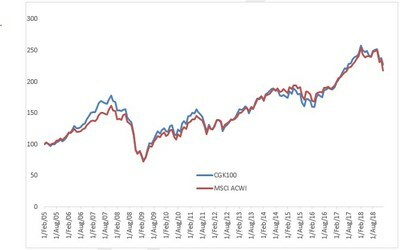 From its inception on February 1, 2005, to December 31, 2018, the Global 100 Index made a net investment return of 127.35 per cent, compared to 118.27 per cent for the MSCI ACWI (see Appendix A below for long-term trend). "The Global 100 companies show that doing what is good for the world can also be good for financial performance," said Toby Heaps, CEO of Corporate Knights. Global 100 companies also consistently outperform MSCI ACWI companies on CEO-to-average-worker compensation equity, board gender diversity, on paying their fair share of taxes, and on various other specific metrics that factor into the ranking. Global 100 companies come from 21 different countries, predominantly in North America (there are 22 American and six Canadian companies on the list) and Western Europe, where 13 countries collectively account for 51 ranked companies. The other 21 ranked companies come from Australia, Brazil, Japan, Singapore, South Korea and Taiwan. Sectorally, 20 ranked companies are in IT and 17 in the financial sector. With the addition of the consumer discretionary, health care, and industrials sectors, these five sectors make up almost three-quarters of the Global 100 in line with its comparator benchmark. For full rankings and methodology details, please see: www.corporateknights.com/global100. About Corporate Knights: Corporate Knights Inc. includes the sustainable business magazine Corporate Knights and a research division that produces rankings and financial product ratings based on corporate sustainability performance. About the Global 100 Most Sustainable Corporations in the World: The Global 100 is an annual project initiated by Corporate Knights, the company for clean capitalism. Launched in 2005, the Global 100 is announced annually on the sidelines of the World Economic Forum in Davos.